I think tablevogue offers a great product for the price but sometimes I see a cover that is really cheap and I know there must be a difference - can you tell me what is it is? As a brand, we made a conscious decision to keep margins slim in order to deliver the most value for you, the customer. Tablevogue is not an easy product to construct and we are proud that we have been able to add unique patented design features, including stitching down the pleat to keep form and the corner two-inch lip eliminating the need for pins or clips. 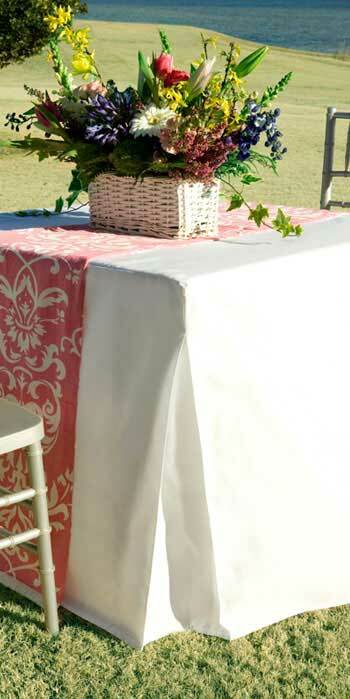 Tablevogue is constructed with WestPoint Home Fabric - the leader in napery textiles. The fabric is a spun product that is heavier in weight giving tablevogue a feel of heavy duck cotton versus flimsiness associated most with polyester. If you see a product that is significantly lower priced - it is most likely 100% filament. A filament polyester is significantly lighter in weight and will most likely snag or pick and require pins or clips to secure on the table in high traffic or outdoor conditions. I guess there is truth to the old saying, "you get what you pay for" but please sign up for our e-mails because we try and offer our customers special offers every chance we get. How long will it take for me to receive my Tablevogue? Immediately and depending on which method of shipping you choose - Tablevogue should arrive in just days. Our product specifications will help you order the correct size. You will need to measure the length, height, and width of your table. Feel free to contact us if you have any questions. What kind of material is Tablevogue made of? Tablevogue's high performance fabric is expertly tailored from crisp, 100% pure polyester. It is machine-washable, and has a patented soil-release feature that allows you to entertain worry-free! WestPoint Home Fabric is the very best fabric and you will love the fit of our patented stylish design but I am sorry to say it is not flame retardant. However- We are pleased to recommend two products - No-Burn Fabric Fire Gard Spray and Firetect Fire-Proof Flame Retardant - that can be administered to your Tablevogue. Both of these products are available on Amazon. Tablevogue is available in white, natural, black, red, peacock, rose, mimosa, surf, chocolate, pine, garnet, sapphire, violet, royale, paprika, silver, blossom, pistachio, sorbet, and picnic plaid. View all of our color options. Can guests sit at the table with these covers on them? Thanks to the inverted pleats on all corners, Tablevogue has a lot of give, providing plenty of leg room. Of course! If you are dissatisfied for any reason, you may return your purchase for a refund of the merchandise value. For more details, please view our return policy.